Blue Willow, A Coloring Book Story. A timeless tale of love found in the pattern on Blue Willow China. • Large format 9 1/4" x 11"
Did you know that the classic Blue Willow china pattern tells a timeless love story? 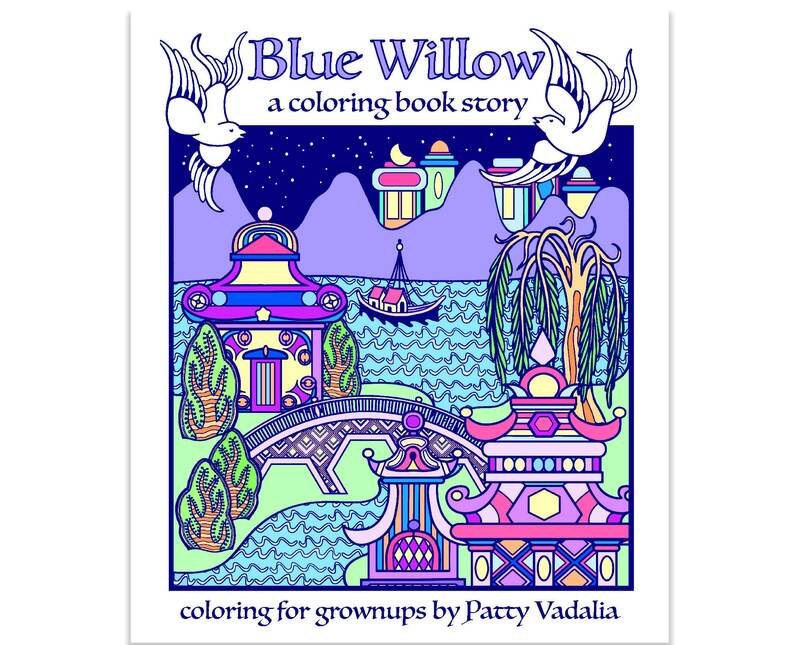 You’ll fall in love with Blue Willow patterns even more when you color in this beautifully illustrated coloring book for adults. Artist Patty Vadalia reveals the story of forbidden love shown in the pattern on Blue Willow china. Enter a timeless realm while you color the story of two lovers who risk all for ove. I love it! Your illustrations are evocative and I am so happy you included the beautiful legend. The coloring book is very well made AND published in my niece's hometown! ...too bad it's MINE! Thank you so much for sharing your talents with us!